Valerie Bowman grew up in Illinois with six sisters (she’s number seven) and a huge supply of historical romance novels. Valerie now lives in Jacksonville, Florida, with her family, including her rascally dog, Roo. Valerie loves to hear from readers. Find her on Facebook, Twitter, and at www.ValerieBowmanBooks.com. Deciding that life had far more to offer than a nine-to-five job, bickering children, and housework of any kind, Tiffany Clare opened up her laptop to write stories she could get lost in. She lives in Toronto with her husband, two kids, and two dogs, and you can find out more about her and her books at www.tiffanyclare.com. USA Today bestselling author Vivienne Lorret loves romance novels, her pink laptop, her husband, and her two sons. Transforming copious amounts of tea into words, she is proud to be an Avon Impulse author of works including Tempting Mr. Weatherstone, The Wallflower Wedding series, and The Rakes of Fallow Hall series. 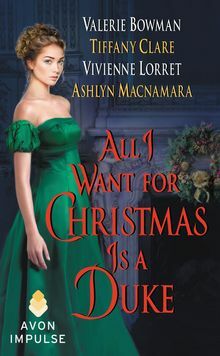 USA Today bestselling author Ashlyn Macnamara writes Regency romance with a dash of wit and a hint of wicked. Although she writes about the past, you can find her in such newfangled places as ashlynmacnamara.net, facebook.com/AuthorAshlynMacnamara, and twitter.com/ashlyn_mac.